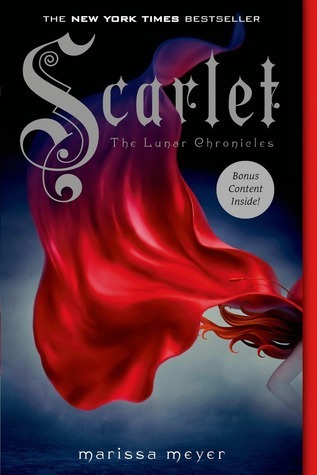 Scarlet was a great addition to the cast of characters introduced in this book and I think a lot of the fact that I enjoyed this book more than Cinder was that I found her more interesting than I did Cinder. Cinder just felt bland to me whereas with Scarlet, her personality really shone through, she was this fierce teen who really loves her grandmother and will do anything to find her and the fact that I liked Scarlet actually meant I was more invested in Cinder’s story in this one because they were tied together. I also really loved Captain Carswell Thorne, another new addition to the cast of characters in this one. He was so charming and funny and I smiled every time he was on the page, he definitely made this book a much more fun read for me than Cinder was. I actually enjoyed him and Cinder together a lot more than her and Kai, not necessarily in a romantic sense, but they just seemed to have more banter and he brought her out of her shell, she didn’t seem quite as bland with him as she did with Kai. Wolf, I’m not entirely sure about. He kind of fills the role of mysterious bad boy and you never really get to know enough about him to make a judgement on whether you like him or not. I did however appreciate the relationship between Scarlet and Wolf way more than I did the one between Cinder and Kai in Cinder, the chemistry was definitely far more there and that meant that the twists later on in the book had far more impact. Still, I’d like to maybe get to learn a little bit more about Wolf if I read the next book. I wasn’t really sure about Kai’s role in this book? I mean he was there, he was doing stuff but to be honest, I don’t think I would have missed him if he wasn’t there, I still find him pretty bland! I thought the fairytale aspects were better utilised in this book, whereas in Cinder it felt like Meyer just lifted everything and adjusted it slightly, in this book, it didn’t feel like Meyer was using absolutely everything from the story of Little Red Riding Hood, she took aspects and twisted them in a way that worked really well for the story. I still really love Iko (my fave character from Cinder) and her being a ship in this one really made me laugh! It was a little strange in the beginning when we jumped straight into Scarlet’s story, when we had left off with Cinder’s in the previous book, and it did take a while for the two separate stories to actually intertwine, so for a while it felt like you were reading two different books, but once Cinder and Thorne and Scarlet and Wolf’s stories did come together, they came together beautifully. I would have liked to maybe see a little bit more of Scarlet and her grandma together, I mean we get through Scarlet that they were close but we don’t really get to see it very much, which is a shame because grandparent/grandchild relationships are incredibly rare in YA. There were definitely a lot more twists and a lot more action in this one which I appreciated, though I had kind of worked out the twist involving Wolf quite early on in the book, there were still several other exciting things that happened that I didn’t see coming. I still would have like a little more world building, I mean we get a pretty good idea of the structure of society on Lunar, but even in a different part of Meyer’s futuristic world, we still don’t get much of an idea of what this futuristic France looks like and I still feel that smushing the entire world into six countries is ridiculous. It also seemed weird that not one person is mentioned speaking French this entire book, given that they are in France? I mean Scarlet calls her grandmother, “grand-mere” but that’s all. I mean I get that maybe we’re meant to interpret that she’s speaking French most of the time, but I still feel like a few more French words thrown in there would have been good. I also still don’t feel like Queen Levana is a scary enough villain, she seems incredibly detached from her supposedly “villainous actions” and I don’t know, I think the fact that we don’t really know anything about her motivations makes her seem like just this bland cookie cutter villain. I liked that this book explored more of Lunar society, the whole LSOP thing was really interesting and I hope we get to see more stuff like that in future books. Overall, this book definitely upped the ante from Cinder, it was faster paced, more intriguing with excellent new additions to the cast of characters in the form of Scarlet and Thorne. I’m still undecided as to whether I will read the third book, Scarlet doesn’t end on such a cliffhanger that I’m dying to pick up Cress right away, so if I do read the third book, it might be a while. Still I am glad to say I enjoyed the second book much more than the first. My next review will be of Tara Sim’s Chainbreaker, an e-ARC I read in December, as the publication date for that one is tomorrow! I’ve been hearing for ages, from what seems like every single blogger in the blogsphere how amazing The Lunar Chronicles is and how much I need to read it, and as luck would have it, when taking part in a book exchange, this was the book that my exchange partner sent me, thereby giving me an opportunity to finally start this series. I have to admit though, I was left kind of underwhelmed and disappointed. I was expecting this book to be really awesome given all the praise I’d heard for it and I guess, given all I’d heard about it, I was expecting it to be much better than it was. It left me feeling, for lack of a better word, “meh” and I know I use that word all the time to describe books that neither make me very excited or that I completely hate, but I really is the perfect way to describe how I feel about these kinds of books! I should have loved it, futuristic world, with androids and cyborgs, but something about it….I don’t really know how to describe it, it just felt off to me. I think maybe a lot of my antipathy towards the book came from my lukewarm reaction to Cinder as a character. Don’t get me wrong, I liked her and she had some great feisty moments and some great witty moments as well but I felt that I didn’t fully “get” her or connect to her as a character and she’s also very inconsistent as a character, which didn’t help me in trying to connect to her. Maybe it’s just because Cinderella was never my favourite princess, I don’t know and I was feeling slightly better towards her by the end of the book, but she’s still not a favourite character of mine.Although I did like that she wasn’t a doormat who couldn’t take care of herself, as Cinderella is usually shown. I actually preferred Iko, the android to Cinder, she was cute and cheeky and made me laugh and I was really sad about what happened to her. I liked the futuristic version of Beijing that Meyer showed us, but I felt like her world could have been so much more developed, we barely scratched the surface of what the world was like in this book, I have a vague idea of what everything looked like, but I felt Meyer could have done so much more to flesh out the world she created particularly given that the Eastern Commonwealth is made up of lots of different cultures and I wish that had been explored a little more. I also felt letumosis wasn’t really explained that well, I mean I got that it was a kind of plague carried by Lunars, but aside from that it kind of confused me as to what it actually was as it seemed kind of half TB/half plague. I also found the whole idea of the world just being six countries in total to be a little laughable! You’re going to combine the entirety of Asia into the Eastern Commonwealth? Okay, I’ll bite, but don’t think for one second I’m not rolling my eyes! I liked that the setting was China rather than America though, that was a refreshing change! I also felt that the big twists in the book weren’t really that big at all. I’m not sure if we were meant to be surprised by the revelation about Dr Erland because it seemed pretty obvious to me (originally I thought he was schizophrenic) but later on in the book it becomes pretty clear what he is. As for the revelations about Cinder, I’ll admit I didn’t see the first one coming, but as soon as I read the first one, I wrote the second one down in my notebook and I was right! I got pretty excited about that actually because usually I never guess big reveals in books, but at the same time, when the actual reveal came I was kind of like “duh, I guessed that like twenty chapters ago”. I’m not sure if she meant to make it obvious or not, but the fact that it was so obvious did take away from the shock factor. I actually found a lot things were predictable, which I didn’t love, because I do like to be surprised sometimes. I thought Kai was cute, but kind of bland, I don’t feel like I got a very good sense of his personality either. Sure he was charming, but there didn’t really seem to be anything more to him than that, which is suppose is consistent to the prince that we are shown in the fairytale, but I wish he could have broken free and been more than that. Despite this, I did actually like his interactions with Cinder, they were cute and I loved how awkward she was around him, it felt very realistic and relatable! I liked that the romance didn’t take over the book either, that was a nice change. I also did feel sorry for Kai, because he was in a horrible situation. I’m hoping in the next book we get to see more of his personality explored though. I didn’t get how he was supposedly so close with his Dad and then barely mentioned him at all after he died, that was weird. I also didn’t like how bratty he was about the Lunars, I mean fair enough, do it behind their backs, but to be bratty to their faces is just stupid! There’s a lot of stuff that’s very unrealistic and eyerolling to be honest, it’s not just the fact that the world is reduced down to six countries total, the palace security is awful, okay they scan IDs but people can come and go pretty easily and that doesn’t seem secure, letumosis is supposedly this really dangerous plague, but as Cinder shows several times, you can get in and out of the quarantine area pretty easily and for such a futuristic society, the quarantine seemed very medieval, the fact that supposedly clever people install a chip in android without knowing that it will make it malfunction and then no one can figure out what is making it malfunction, the city’s best mechanic is a teenage girl despite the fact that it’s meant to be a very advanced city, there’s an evil queen who can brainwash people and yet they don’t think about that until after she’s arrived and don’t take any precautions…..seriously? I could probably think of more, but you get my point. I mean, I get suspending disbelief when you’re reading a book because it is fiction and not reality, but I have to draw a line somewhere! Also the book doesn’t really come to a natural end, it sort of just stops. I don’t mind cliffhanger endings but it didn’t feel natural, it just felt like the book stopped dead at the cliffhanger and I don’t know, I didn’t really like it. The book was also very slow, I hate to say that nothing really happened, because that makes the book seem like a waste, but it was a lot of stuff recycled over and over again, Cinder and Kai flirt, Cinder goes to the palace, Cinder runs away, Cinder argues with Adri, right until the end it didn’t feel like the story was really going anywhere, then it finally starts to move a little and it’s the end. Seriously? It was frustating! I also felt like she stuck too closely to the original Cinderella story despite the futuristic twists and because of this the characters were kind of stuck, as fairytale characters tend to be very one dimensional and that’s what I found with the characters in this book, they were all very one dimensional and we didn’t really get to see the shades of grey in them. They all seemed to be archetypes, Kai was Prince Charming, Adri was the evil stepmother, Peony and Pearl were the stepsisters, Levana’s character is from Snow White, but she’s the evil queen, and none of them really strayed out of their archetypes, aside from maybe Peony who was actually nice, whereas both the stepsisters in Cinderella are evil. I did like some of the Cinderella references that were in the book, but the ball felt kind of out of place, given the huge crisis with letumosis that the world is going through, you’re seriously going to throw a ball, soon after your Emperor has just died and an evil queen is likely to be taking over your country? Seems like they had bigger things to worry about than what to wear to the ball! I really liked Cinder’s relationship with Peony and it made me sad what happened to her because Peony was one of the few characters in the book that I actually really liked. I also liked the Doctor, his crazy, mad scientist persona was really fun to read. I found the fact that Cinder had the ability to tell if people we’re lying to her because of her being a cyborg was really cool, I wish I had that! I can’t really say anything about Marissa Meyer’s writing style either way, I didn’t love it but I didn’t hate it either, it was kind of like the story to be honest, a little bland. I like it when I can pick out pretty quotes from the books I read and I couldn’t really do that here. I was kind of disappointed with Queen Levana as well, I mean sure, I hated her, so in that respect she was a good villain, but like all of the other characters in this book, she was underdeveloped, I don’t feel like I understood what underpinned her motivations at all. I’m hoping that maybe in the later books, her character will be expanded upon more because I reckon she’s a really interesting character that just hasn’t been explored yet. In fact I’d like to know more about the Lunars in general, they’re not really explained all that well in this book, I’m not sure if they’re humans or aliens or what, and I’d like to know! I have far too many questions about the Lunars and their society and everything! All we really get is that they don’t like mirrors. I also didn’t understand all the “Linh” terms like Kai referring to Cinder as Linh-mei, I know Linh is her last name, but I don’t know what the “mei” means and it confused me. It’s also never really explained what Kai sees in Cinder. He’s the emperor of a huge nation, one of only six in the entire world and yet he wants her. I know that the powerful man falling in love with the common girl is an often used trope and this is a Cinderella retelling, Prince Charming is meant to fall in love with Cinderella, but it’s never explained exactly what he sees in her in particular and I never really got the feeling that she was special to him. I liked their interactions, sure, I thought they were sweet, but I never felt like Cinder was special to Kai, it felt like he was just using her to avoid Levana. Still there is potential there, so I’m hoping their romance develops better in the next few books. I still don’t really have a very good idea what the characters look like, like Prince Kai is said to be cute but he isn’t really described, neither is Cinder in great detail and I would have liked to have a better idea of what they looked like in my head. I did appreciate however, the scene were Cinder went to the ball all messed up, because it showed the whole “you don’t have to be beautiful to be a princess thing” which I really liked. Overall, I can’t say I was thrilled with this book, the predictable plot and lack of world development, in addition to the fact that the secondary characters were more appealing than the primary characters to me, meant that I didn’t enjoy the book as much as I should have done, given the awesome concept of it. Still, I am going to continue with the series, as I’ve heard that it gets better with each book and I need to find out what happens after the end of this book! The next book I’ll be reviewing is Code Name Verity by Elizabeth Wein, which I have to say I’m really enjoying at the moment!